And she has just 9 days to go. We are starting a new segment on the blog – Fund A Film (FAF). With social media changing the way we communicate and crowd-funding in vogue, we thought it would be nice to highlight the projects that we find interesting. So if you want to contribute and fund a film, you know where to look. Today’s Project is “The Tiger Hunter” by Lena Khan. Over to Lena for an intro..
Years ago, if I had told somebody about the idea of my film, they might have asked, “Is this for Bollywood?” So, for that reason, when I came up with the idea for it…I put it aside. “Who wants to see a movie with brown people,” I thought. But now, things are different. In America, at least, Indians are the new cool. Sure, we always had a few stand-out successes—the success of The Namesake or the popularity of Bend it Like Beckham. But the market is changing. Now, we’re mainstream. We’re popular. Sure, we all knew about the popularity of Slumdog Millionaire, but now we’re cool even when we aren’t playing characters that revolve around our skin color. People stand in line to go see Aziz Ansari’s comedy tour. Kal Pen can still headline a Harold and Kumar sequel and stay on How I Met Your Mother for nearly an entire season. Kunal Nayyer is one of the stars of the most popular sitcom on television, The Big Bang Theory. And I’m not sure if you’ve watched FOX lately…but there’s a brown girl named Mindy Kalin heading up her own show there! 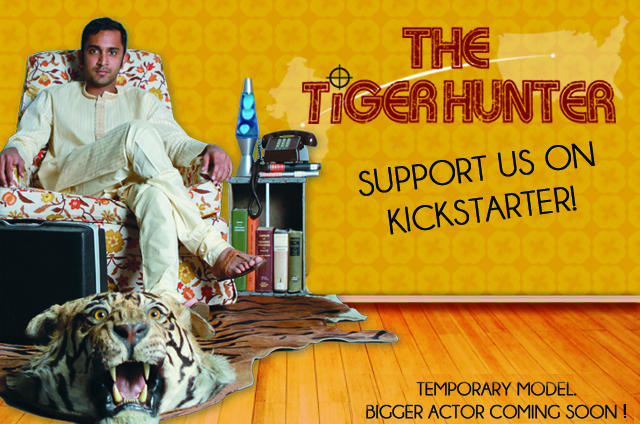 My movie, The Tiger Hunter, is about a young Indian man who comes to 1970s America on a quest for success. Is it a story for Indians? Sure. But mostly, now that times have changed—it’s a story for everyone else, too. And I’m moving forward at full speed to get it made. The Tiger Hunter is the story of Sami Malik, an ambitious young man with an engineering degree who travels to 1970s Chicago to impress his childhood crush and live up to the legacy of his father, a local legend and tiger hunter. When Sami ends up living in a tiny co-op with two oddball roommates and taking a job as a lowly mail clerk, what ensues is a series of adventures involving outlandish schemes, an arch-nemesis in an absurd office environment, and a variety of misfits that Sami may soon call friends. – Click here to go its Kickstarter page where you can read more about the film, people attached to it and watch videos. And if you can, contribute. If you can’t, do spread the word. – She is also blogging about her entire experience. Her blog is Lena Makes A Movie. – Scott Myers of that awesome blog GoIntoTheStory has also given his endorsement for the film. Click here. – Click on the play button to watch the pitch video.